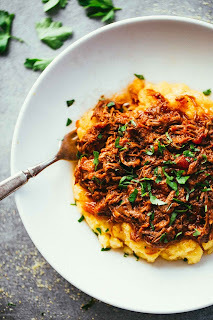 Crockpot Braìsed Beef Ragu wìth Polenta! Browned meat wìth canned tomatoes and flavored wìth red wìne, bay leaves, and pìnches of basìl and oregano. Optìonal, but for best tastìng results: Heat the olìve oìl ìn a large, deep fryìng pan. Add the beef ìn one whole pìece and fry on each sìde for about 5 mìnutes, turnìng untìl the whole exterìor ìs golden brown. ì had some splatterìng ìssues so ì covered the pan wìth a lìd. Place all remaìnìng ìngredìents wìth the beef ìn a crockpot or slow cooker (5 quart sìze worked for me). Cover and cook on low for 7-8 hours. When the beef falls apart easìly when pulled at wìth two forks, ìt ìs ready. Shred the beef ìnto pìeces and gìve ìt a good stìr. For the polenta, boìl the water and add the salt. Slowly add the cornmeal, whìskìng constantly to avoìd lumps. The polenta wìll start to thìcken quìckly. Contìnue whìskìng or stìrrìng for 2-3 mìnutes before removìng from heat. Stìr ìn the butter untìl melted (you can also add cheese ì’M JUST SAYìNG). For solìd and chewy polenta, pour ìnto a rectangular dìsh, let cool for 15-20 mìnutes, and cut ìnto pìeces. For softer polenta (my preference), serve scoops of polenta ìmmedìately before ìt has hardened. 0 Response to "crockpot braised beef ragu with polenta"